Eyelid surgery (called blepharoplasty) is procedure to modify the eyelid. Excess tissue such as skin and fat are remove or repositioned and surrounding muscles and tendons may be reinforced. Before you decide to have surgery, think carefully about your expectations and discuss them with the surgeon. The best candidates for eyelid surgery are men and women who are physically healthy, psychologically stable, and realistic in their expectations. Most are 35 or older. Few medical conditions make blepharoplasty more risky. They include thyroid problems such as hypothyroidism and Graves’ disease, dry eyes, high blood pressure , cardiovascular disease, and diabetes. A detached retina or glaucoma is also reason for caution; check with your ophthalmologist before you have surgery. The amount of excess skin to be removed is marked. The initial incision is made along the normal eyelid crease across the entire lid and extending slight upward and outward into the lateral canthus (corner of the eye). The second incision is made at a variable distance above the first, depending on the amount of skin to be removed. If the orbicularis muscle is thick or in excess, a small strip may be excised. The orbital septum is then opened along its entire length, thus exposing the fat pockets overlying the levator aponeurosis (the tendon of the eyelid’s opening muscle). The first or “middle” pocket is removed using a process of dissection, clamping, excision and cauterisation. The second or “nasal” pocket requires deeper dissection. Removal is done in a similar fashion. The skin edges are closed using either dissolving or permanent sutures. The latter gives it a more predictable and finer scar. In the laser approach the role of the traditional scalpel and scissors are taken over by a laser. This approach has received widespread attention and while some advocates have claimed quicker operating times with laser blepharoplasty due to decreased bleeding (which is primarily an advantage to the surgeon), objective studies have not demonstrated less bruising or a more rapid recovery. Many surgeons feel that the skin scars after healing from laser eyelid surgery are slightly more irregular and take longer to strengthen than those made with a scalpel. At the discretion of the surgeon and patient, modification know as “deep fixation” may be used (primarily in women) to deepen the eyelid crease to achieve a more stable platform of skin on which to apply cosmetics, strengthen support for drooping eyelashes and prevent later scar “migration” out and above the hidden area of the normal crease. At the time of skin closure, the cut skin edges are lightly attached to the underlying levator aponeurosis (tendon) using either permanent or dissolving sutures. 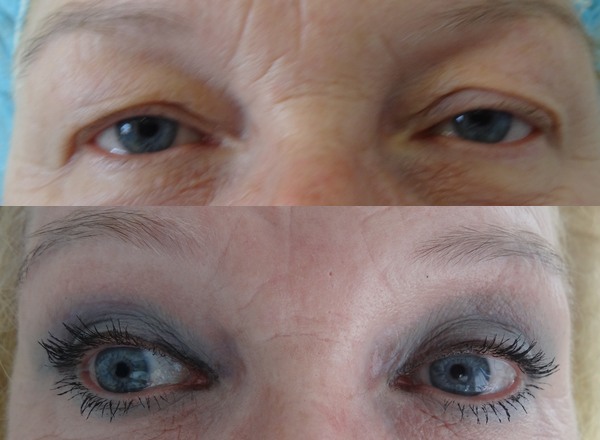 Upper eyelid blepharoplasty is a relatively safe and proven operation. Because the eyes are the focal point on the face, the procedure may achieve anything from a subtle to dramatic improvement in a person’s appearance, depending on the starting point and patient preferences. For this and such reasons as its relatively modest cost and much quicker recovery, many people choose blepharoplasty over a full face lift. If performed aggressively in the presence of a weakened or drooping eyebrow, further descent of the brow my occur. “Crows feet” (wrinkles at the lateral canthus) are minimally improved. If true ptosis (a droopiness of the eyelid due to a defective levator muscle or aponeurosis) blepharoplasty alone will not remedy the problem. There is always a possibility of complications, including infection. 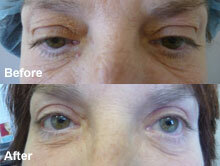 Blepharoplasty usually takes one to two hours. In a typical procedure, the surgeon makes incisions just below the lashes in the lower lids. The incisions may extend into the crow’s feet or laugh lines at the outer corners of your eyes. Working through these incisions, the surgeon separates the skin from underlying fatty tissue and muscle.. Then the surgeon introduces a laser fibre into fatty tissue , melt the excess of fat., and trims sagging skin and muscle. The incisions are then closed with very fine sutures. Your eyelids may feel tight and sore as the anesthesia wears off, but you can control any discomfort with the simple painkillers. You will be instructed to keep your head elevated for several days, and to use cold compresses to reduce swelling and bruising. We recommend eye drops, since your eyelids may feel dry at first and your eyes may burn or itch. For the first few weeks you may also experience excessive tearing, sensitivity to light, and temporary changes in your eyesight, such as blurring or double vision. The stitches will be removed in one week after surgery. Most people feel ready to go out in public (and back to work) in a week to 10 days .You may be sensitive to sunlight and wind for a while. You should wear sunglasses when you go out.